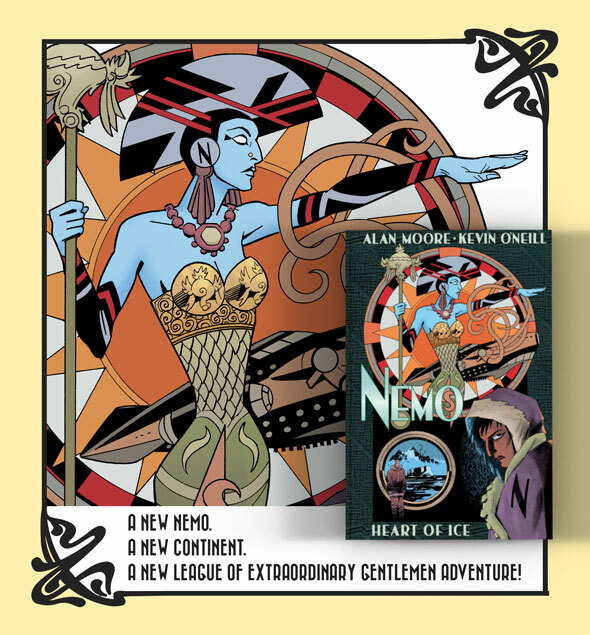 In the grim cold of February surfaces a thrilling new League of Extraordinary Gentlemen book: NEMO: HEART OF ICE, a full-color 56-page adventure in the classic pulp tradition by the inestimable Alan Moore and Kevin O'Neill. It's 1925, fifteen long years since Janni Dakkar first tried to escape the legacy of her dying science-pirate father, only to accept her destiny as the new Nemo, captain of the legendary Nautilus. Now, tired of her unending spree of plunder and destruction, Janni launches a grand expedition to surpass her father's greatest failure: the exploration of Antarctica. Hot on her frozen trail are a trio of genius inventors, hired by an influential publishing tycoon to retrieve the plundered valuables of an African queen. It's a deadly race to the bottom of the world -- an uncharted land of wonder and horror where time is broken and the mountains bring madness. Jules Verne meets H.P. Lovecraft in the unforgettable final showdown, lost in the living, beating and appallingly inhuman HEART OF ICE. Weihnachtszeit bzw. Adventszeit oder auch Sidozeit, wie diese Zeit in manchen Liedern besungen wird, hat viele Gesichter und Formen. Eine Form der Weihnachtszeit ist die Adventsquitzchenzeit. Adventsquitzchenzeit beginnt traditionell am ersten Wochenende des Dezembers und endet irgendwann Ende Dezember. In der Adventsquitzchenzeit ist es üblich, sich auch mal um die schönen Dinge im Leben zu kümmern und auch mal einen Gang runterzuschalten oder mal ne Geschichte zu lesen oder ne Geschichte zu erzählen, naja, eben mal was für's Herz. Dann guckt doch mal so rund um die -Adventssonntage- Adventsquitzchensonntage hier auf dem Unfug Blog vorbei!